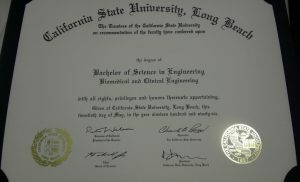 Our Fake College Transcripts are printed on Official Academic Transcript Paper that includes many anti-copy and other security features like thermal sensitivity (areas of dark blue will become temporarily white when touched), which lends little doubt as to their “authenticity”. All transcripts will contain the proper coursework to achieve the desired chosen Degree and Major selected. For example, a B.S. in Biology will denote 120+ credit hours that consist of the core major requirements, prerequisites, electives and required general education courses like English, Social Sciences, Math, speech communication, etc., into 8 full-time semesters of 12 to 16 credit hours each term. 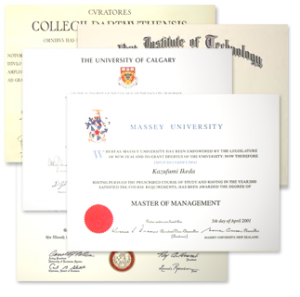 In fact, we will produce any major, and when checking out, select “OTHER” near the end of the list and type in the Degree and Major you’d like. The individual courses are graded so that the over-all GPA will come to approximately 3.50-3.65, unless otherwise requested. We ask for a student ID# on the order form, and this is simply added for realism; we recommend 7-10 digits. Our transcript quality is uncanny and we’ve created registrar signature stamps that would certainly exceed what one might expect from traditional fake transcripts. Over this stamp, we emboss with our custom embossing seal, “OFFICE OF THE REGISTRAR”. 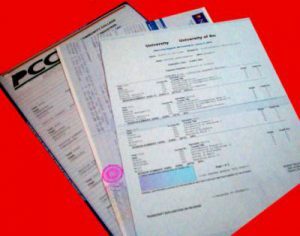 The back of the transcript contains the Transcript legend or “key” indicating a break-down and meaning of the grades, credit hours, and points and descriptions of various other aspects of the transcripts. 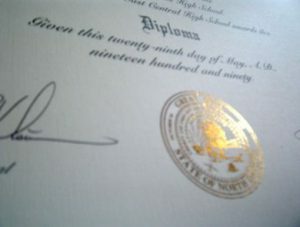 Please Note: We make transcripts to be entirely realistic, but we do not attempt to duplicate them against real ones as we do with diplomas. You WILL get, however, correct logo and seal, including an embossed registrar signature stamp, among many other features that can be seen in our samples.